Guitarist/vocalist Tom Gabriel Fischer (then known as Satanic Slaughter) and bassist/vocalist Steve Warrior formed the band in March 1982, originally naming it "Hammerhead". They were subsequently joined by drummer Bruce Day. 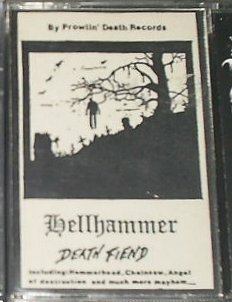 In spite of their rather marginal musical and technical quality, demo tapes called Triumph of Death and Satanic Rites became underground, word-of-mouth hits and the band was eventually picked up by German-based Noise Records (1984). Steve Warrior had been replaced by former Schizo bassist Martin Eric Ain, a change which marked the beginning of a serious and radical transformation in the band's music and lyrics. 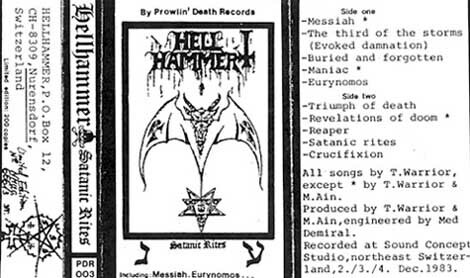 These changes were ultimately responsible for Fischer's and Ain's increasing feeling of being limited within the confines of the purposely primitive Hellhammer vehicle. 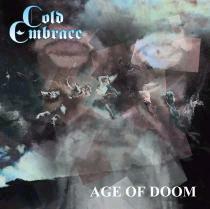 A legendary four-track 12" EP, Apocalyptic Raids, was released in March 1984. At the time, it was regarded as one of the heaviest and most extreme records yet produced. 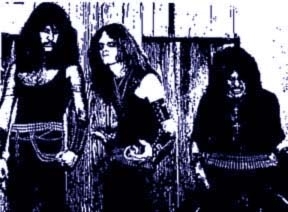 By then, the band had already broken up, but the recording was one of the original black/death metal recordings, and spawned a legion of imitators, playing doom metal, thrash metal, black metal and death metal. Both Fischer and Ain later teamed up again when forming the seminal Celtic Frost in summer of 1984. 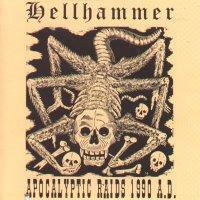 Apocalyptic Raids was officially re-issued in expanded form on CD in 1990; this project was overseen by Ain. 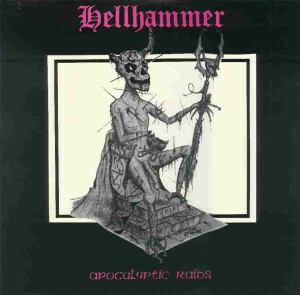 Countless Hellhammer covers exist by countless underground bands. 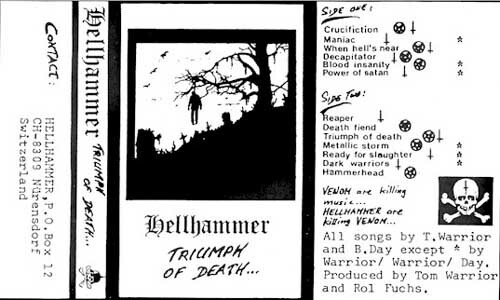 The best-known Hellhammer covers were done by mainstream metal bands Napalm Death and Sepultura, both of whom covered the Hellhammer song "Messiah." Fischer's post-Celtic Frost band, Apollyon Sun, did a re-working of that song as well. - Apocalyptic Raids 1990 A.D.